Andy Hill is proud to serve MountainTrue as the High Country Regional Director and Watauga Riverkeeper. Andy has a passion for clean, cold, fishable, drinkable and swimmable water. As a long-time fly fisherman, educator and guide, he is intimately familiar with our watershed from the headwaters to the tailwater and is passionate about protecting the places we love. Andy’s love for the Southern Appalachians brought him to Appalachian State University, where he received his Bachelor of Science in Outdoor Experiential Education and his Masters in College Outdoor Program Administration. Following his passion for outdoor recreation, Andy has led community service trips both locally and around the globe for several adventure travel programs. Also a NOLS graduate, he thrives on using the outdoors as a source of learning and connecting people with our shared wild places. 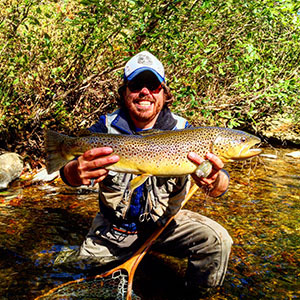 Andy is active in the community as the founder of Fish Goat Guide Service based in Valle Crucis, and the proud founder of the Fly Fishing Program at Lees-McRae College. He is also an adjunct instructor at Appalachian State University, teaching courses in Natural Resource Management, Paddlesports and Leadership & Group Dynamics, and serves on the board of the High Country chapter of Trout Unlimited. Andy lives on a tributary of the Watauga with his wife Bettie and their young daughter. They can often be found splashing around our watershed.